From the point of view of other animals, humans are a deadly, invasive species that spreads through pristine forests, cutting down trees, prospecting for oil and minerals, killing anything that's either tasty or in the way, and poisoning the earth and the rivers. And now our species has upset the balance to the point where a virus that had lived relatively harmlessly for thousands, maybe millions of years among animals who were largely immune to it has now escaped and is threatening great apes and who-knows-how-many-other species with extinction. Humans Most Likely Source of Deadly Infection . . .
That's because while most of us seven billion humans are at small risk of catching Ebola, the same is not true for our great ape cousins. They're catching it in droves. We don't know the numbers yet, but with gorillas and chimpanzees already facing extinction, Ebola could be the final coup-de-grace. The primary cause of the decline in the numbers during this period was commercial hunting, facilitated by the rapid expansion of mechanized logging. Furthermore, Ebola hemorrhagic fever is currently spreading through ape populations in Gabon and Congo, and now rivals hunting as a threat to apes. Gorillas and common chimpanzees should be elevated immediately to "critically endangered" status. Without aggressive investments in law enforcement, protected area management and Ebola prevention, the next decade will see our closest relatives pushed to the brink of extinction. 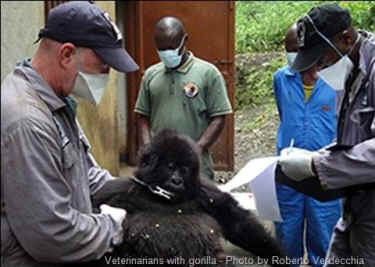 Another study concluded that the especially virulent Zaire strain of Ebola had killed about 5,000 gorillas in one year and that this was in just the one area where the study was being conducted. It may be several years before we know how badly the current outbreak has affected our great ape cousins. But we can be fairly sure that what's unfolding for them is a catastrophe – quite possibly a terminal one. By comparison, the effect of a few thousand human deaths among a population of more than seven billion is barely noticeable. This is not to sound crass and uncaring. But once again, as always, the concern of our own species is me, myself and us. So, any suffering we humans may be experiencing right now is essentially just blowback from what we've unleashed on them. Are we likely to take a lesson from what's happening to our fellow primates and get out of their hair? Unlikely. Worse, right now, they're just going from the frying pan into the fire. Medical researchers want to know how other kinds of animals react to the Ebola virus. And that means the vivisection laboratories will be having a field day. In a typical series of experiments in Canada in 2012, researchers injected a number of piglets with the extra-deadly Zaire strain of the Ebola virus. The piglets were then placed in a room with macaque monkeys, all in separate cages to prevent direct contact, and the researchers looked on as the piglets survived and the monkeys all died. Lead researcher Gary Kobinger commented that "we still don’t know if pigs are playing any role in the natural transmission or ecology of Ebola virus in Africa." 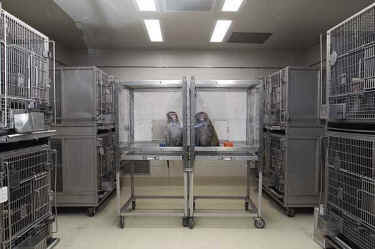 Right now, new experiments are going into high gear with monkeys and other animals. And it's probably safe to assume that chimpanzees will soon be on the laboratory table, too – just when it was looking as though they might get a break and be phased out of life at the lab. 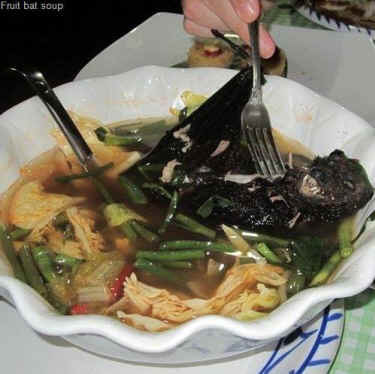 What about other kinds of animals? How might they react to Ebola? And could humans catch the disease from them? Dogs may well end up in laboratories, too. Twelve years ago, in Gabon, researchers tested the blood of 258 street dogs and found that more than one in four had Ebola antibodies, meaning they'd been infected and their immune systems had reacted. Dogs haven't ever shown symptoms of the disease, and David Moore, an expert in infectious diseases from the London School of Hygiene and Tropical Medicine, said that for this reason "there is absolutely no evidence to support a role for dogs in transmission." But that doesn't mean they won't be used in experiments, if only to try to learn why they create antibodies to build up immunity while not getting sick. We humans are probably at greatest danger from birds. A study from Purdue University found that the Ebola virus closely resembles several bird flu viruses. According to chief researcher David Sanders, "The resemblance among all these viruses should encourage health officials to be on guard for it." Ever since H5N1 started killing people, bird flu has been a major source of concern to public health authorities. Whenever a single bird with H5N1 or similar strain shows up at a chicken factory farm, the response is immediate: mass killing and incineration of birds by the thousands. 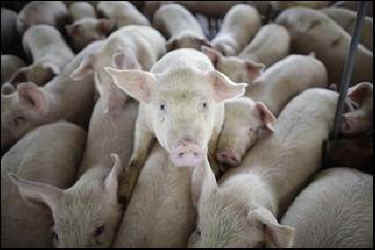 The 2009 "swine flu" that caused minor panic was the result of pigs at a factory farm in Mexico catching one strain of flu from birds and another from human workers at the factory. The pigs mixed the two into a new strain that the humans then caught from them and then began to transmit around the world. The big fear now is that Ebola could get mixed up with bird flu or other viruses, again perhaps in pigs, and then given back to humans in a new, easily transmissible form. All in all, we have good reason to worry. Our chickens, so to speak, have come home to roost. But there are also other animals who have even greater reason to worry. And some of them may soon be gone forever. They deserve a passing thought, too.